Şengen zonası (ing. Schengen Area; fr. 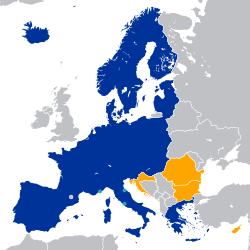 Espace Schengen)- Lüksemburqun, Şengen şəhərində 1985-ci ildə imzalanmış Şengen müqaviləsinə əsasən 25 Avropa dövlətində daxili vizasız hərəkəti təmin edən şərti ərazi. Şengen zonası daxilində hərəkət edənlər üçün sərhəd yoxlanışı tələb olunmur və səyahətçilər vahid ölkə prinsipi ilə hərəkət edərək 25 Avropa ölkəsinə sərbəst şəkildə hərəkət edə bilirlər. I Şengen müqaviləsi 1985-ci ilin 14 iyun tarixində beş Avropa ölkəsi arasında imzalanmışdır. Müqaviləni Fransa, Qərbi Almaniya ilə yanaşı Benilüks ölkələri olan Belçika, Hollandiya və Luksemburq imzalanmışdır. 1990-cı ilin 19 iyun tarixində Şengen Müqaviləsinin Tətbiq Konvensiyasının imzalanması ilə razılaşma qüvvəyə minmişdir. Müqavilə Lüksemburq, Fransa və Almaniyanın sərhədlərinin kəsişdiyi yer olan Lüksemburqun Şengen şəhərində imzalandığından həmin şəhərin adına adlandırılmışdır. İkinci müqavilə isə Mos çayının ortasındakı Kraliça Mari-Astrid adlı gəmidə imzalanmışıdır. Müqavilənin qüvvəyə minməsi 1995-ci ilin 26 mart tarixinə qədər uzanmış və bu müddət ərzində Portuqaliya və İspaniya da Şengen zonasına qoşulmuşdur. Monako, Norveç və İslandiya Avropa İttifaqının üzvü olmamaqlarına baxmayaraq şengen zonasına daxil edilmişdir. Eyni zamanda İsveçrə 2008-ci ilin dekabr ayında Şengen müqaviləsi sahəsinə qəbul edilmişdir. Lixtenşteynin Şengen zonasına daxil olması bir necə dəfə təxirə salınmışdır. Ölkə 2008-ci ilin 28 fevral tarixində Avropa İttifaqı ilə Şengen razılığı əldə etmiş və 2009-cu ilin 1 noyabr tarixində Şengen zonasına daxil olması razılaşdırılmışdır. Lixtenşteynin daxili vergi nizamlanmasında problemlərinin olduğunu əsas gətirərək Almaniya və İsveç ölkənin şengen zonasına daxil olması tələbəni müvəqqəti dondurmuşdur. 2011-ci ilin 7 mart tarixində Avropa İttifaqı Nazirlər Şurasının qərarı ilə Lixtenşteynin şengen zonasına daxil olması yolu açılmışdır. 2011-ci ilin 19 dekabr tarixində ölkə rəsmən şengen zonasının üzvü seçilmişdir. Şengen müqaviləsi əsasında yaradılan Şengen zonası hal-hazırda 26 Avropa ölkəsində qüvvədədir və təqribən 4.312.099 kvadrat kilometr ərazini əhatə edir. ↑ The original agreement, a subsequent protocol extending the agreement to the state, an agreement on accession to the EU, or agreement on association with the Schengen acquis. ↑ Of the provisions related to the elimination of border controls. In some cases the provisions related to the Schengen Information System were applied earlier. ↑ The elimination of border controls took place from 1 December 1997 to 31 March 1998. ↑ 4,0 4,1 4,2 4,3 4,4 4,5 4,6 4,7 4,8 For overland borders and seaports; since 30 March 2008 also for airports. ↑ Greenland and the Faroe Islands are not included in the Schengen area. However, persons travelling between the Faroe Islands, Greenland and the Schengen Area are not subject to border checks. A Schengen visa will not allow the holder access to either territory, only a Danish visa stamped with either "Valid for the Faroe Islands" or "Valid for Greenland", or both. ↑ The overseas departments and collectivities of France are not part of the Schengen Area. However, when travelling by air to an overseas department from mainland France (but not from other Schengen countries, such as on the Frankfurt-Martinique flight by Condor), border checks only take place at the departure airport, not at the arrival airport (passengers walk past the passport control booths, which will be unstaffed). When exiting an overseas department, or entering by sea, border checks still take place. ↑ East Germany became part of the Federal Republic of Germany, joining Schengen, on 3 October 1990. ↑ The elimination of border controls took place from 1 January 2000 to 26 March 2000. ↑ 9,0 9,1 9,2 9,3 EFTA state, which is outside the EU, that is associated with the Schengen activities of the EU, and where the Schengen rules apply. ↑ 10,0 10,1 A second agreement, which replaced the first, was signed with Iceland and Norway following the incorporation of the Schengen Agreement into EU law with the Treaty of Amsterdam of 1997. ↑ The elimination of border controls took place from 26 October 1997 to 31 March 1998. ↑ The full Schengen acquis applies to all Spanish territories, but there are border checks on departure from Ceuta and Melilla to Spain or other Schengen countries, because of specific arrangements for visa exemptions for Moroccan nationals resident in the provinces of Tetuan and Nador. ↑ For overland borders and seaports; since 29 March 2009 also for airports. ↑ "Eurostat Population Estimate". Eurostat. 1 January 2010. http://epp.eurostat.ec.europa.eu/tgm/table.do?tab=table&language=en&pcode=tps00001&tableSelection=1&footnotes=yes&labeling=labels&plugin=1. İstifadə tarixi: 8 January 2010. ↑ "Protocol on the accession of the Government of the Republic of Austria to the Agreement between the Governments of the Member States of the Benelux Economic Union, the Federal Republic of Germany and the French Republic on the gradual abolition of controls at their common borders, signed at Schengen on 14 June 1985, as amended by the Protocols of 27 November 1990, 25 June 1991 and 6 November 1992 on the accession of the Governments of the Italian Republic, the Kingdom of Spain and the Portuguese Republic and the Hellenic Republic, respectively". Government of the Netherlands. https://verdragenbank.overheid.nl/en/Treaty/Details/006127.html. İstifadə tarixi: 2014-10-31. ↑ 3,0 3,1 "Beschluß des Exekutivausschusses zur Inkraftsetzung des Schengener Durchführungsübereinkommens in Österreich". 1997-10-07. https://www.ris.bka.gv.at/GeltendeFassung.wxe?Abfrage=Bundesnormen&Gesetzesnummer=10006000. İstifadə tarixi: 2014-11-01. ↑ 4,0 4,1 (1999-07-10) "Council Decision of 20 May 1999 concerning the definition of the Schengen acquis for the purpose of determining, in conformity with the relevant provisions of the Treaty establishing the European Community and the Treaty on European Union, the legal basis for each of the provisions or decisions which constitute the acquis". Official Journal of the European Union L. İstifadə tarixi: 2014-11-01. ↑ 5,0 5,1 5,2 5,3 5,4 5,5 "Agreement between the Governments of the States of the Benelux Economic Union, the Federal Republic of Germany and the French Republic on the Gradual Abolition of Checks at their Common Borders". Government of the Netherlands. https://verdragenbank.overheid.nl/en/Treaty/Details/000058.html. İstifadə tarixi: 2014-10-31. ↑ 6,0 6,1 6,2 6,3 6,4 6,5 6,6 6,7 (1994-12-22) "Decision of the Executive Committee of 22 December 1994 on bringing into force the Convention implementing the Schengen Agreement of 19 June 1990". Official Journal of the European Union L. İstifadə tarixi: 2014-10-31. ↑ 7,0 7,1 7,2 7,3 7,4 7,5 7,6 7,7 7,8 "Treaty between the Kingdom of Belgium, the Kingdom of Denmark, the Federal Republic of Germany, the Hellenic Republic, the Kingdom of Spain, the French Republic, Ireland, the Italian Republic, the Grand Duchy of Luxembourg, the Kingdom of the Netherlands, the Republic of Austria, the Portuguese Republic, the Republic of Finland, the Kingdom of Sweden, the United Kingdom of Great Britain and Northern Ireland (Member States of the European Union) and the Czech Republic, the Republic of Estonia, the Republic of Cyprus, the Republic of Latvia, the Republic of Lithuania, the Republic of Hungary, the Republic of Malta, the Republic of Poland, the Republic of Slovenia, the Slovak Republic concerning the accession of the Czech Republic, the Republic of Estonia, the Republic of Cyprus, the Republic of Latvia, the Republic of Lithuania, the Republic of Hungary, the Republic of Malta, the Republic of Poland, the Republic of Slovenia and the Slovak Republic to the European Union (Deposited with the Government of the Italian Republic)". Council of the European Union. http://www.consilium.europa.eu/en/documents-publications/agreements-conventions/agreement/?aid=2003007. İstifadə tarixi: 2014-11-01. ↑ 8,0 8,1 8,2 8,3 8,4 8,5 8,6 8,7 8,8 8,9 (2007-12-08) "COUNCIL DECISION of 6 December 2007 on the full application of the provisions of the Schengen acquis in the Czech Republic, the Republic of Estonia, the Republic of Latvia, the Republic of Lithuania, the Republic of Hungary, the Republic of Malta, the Republic of Poland, the Republic of Slovenia and the Slovak Republic". Official Journal of the European Union L. İstifadə tarixi: 2014-10-27. ↑ "The final step of Schengen enlargement—controls at internal air borders to be abolished in late March". Slovenia's EU Presidency. 25 March 2008. http://www.eu2008.si/en/News_and_Documents/Press_Releases/March/0325MNZschengen.html. ↑ "General Information on Schengen Short-Term Visas". Royal Danish Embassy in London. 4 June 2009. Arxivləşdirilib:  saytından 10 January 2010 tarixində. https://web.archive.org/web/20100110021548/http://www.amblondon.um.dk/en/menu/ConsularServices/Visas/ShortTermVisas. İstifadə tarixi: 1 February 2010. ↑ "Protocol on the accession of the Kingdom of Denmark to the Agreement on the gradual abolition of controls at the contracting parties' common borders, signed at Schengen on 14 June 1985". Government of the Netherlands. https://verdragenbank.overheid.nl/en/Treaty/Details/007473.html. İstifadə tarixi: 2014-10-31. ↑ 13,0 13,1 13,2 13,3 13,4 (2000-12-09) "COUNCIL DECISION of 1 December 2000 on the application of the Schengen acquis in Denmark, Finland and Sweden, and in Iceland and Norway". Official Journal of the European Union L. İstifadə tarixi: 2014-10-27. ↑ "Protocol on the accession of the Government of the Republic of Finland to the Agreement on the gradual abolition of controls at the contracting parties' common borders, signed at Schengen on 14 June 1985". Government of the Netherlands. https://verdragenbank.overheid.nl/en/Treaty/Details/007475.html. İstifadə tarixi: 2014-10-31. ↑ "Protocol on the accession of the Government of the Hellenic Republic to the Agreement between the Governments of the Member States of the Benelux Economic Union, the Federal Republic of Germany and the French Republic on the gradual abolition of controls at their common borders, signed at Schengen on 14 June 1985, as amended by the Protocol signed at Paris on 27 November 1990 on the accession of the Government of the Italian Republic and by the Protocols signed at Bonn on 25 June 1991 on the accession of the Governments of the Kingdom of Spain and the Portuguese Republic". Government of the Netherlands. https://verdragenbank.overheid.nl/en/Treaty/Details/005115.html. İstifadə tarixi: 2014-10-31. ↑ 16,0 16,1 (2000-12-09) "COUNCIL DECISION of 13 December 1999 on the full application of the Schengen acquis in Greece". Official Journal of the European Union L. İstifadə tarixi: 2014-10-27. ↑ 18,0 18,1 "Cooperation agreement between the Kingdom of Belgium, the Federal Republic of Germany, the French Republic, the Grand Duchy of Luxembourg, the Kingdom of the Netherlands, the Italian Republic, the Kingdom of Spain, the Portuguese Republic, the Hellenic Republic, the Republic of Austria, the Kingdom of Denmark, the Republic of Finland, the Kingdom of Sweden, i.e. the Contracting Parties to the Schengen Agreement and to the Schengen Convention, and the Republic of Iceland and the Kingdom of Norway, on the gradual abolition of controls at their common borders". Government of the Netherlands. https://verdragenbank.overheid.nl/en/Treaty/Details/007472.html. İstifadə tarixi: 2014-11-01. ↑ 19,0 19,1 "Agreement with the Republic of Iceland and the Kingdom of Norway concerning the latters' association with the implementation, application and development of the Schengen acquis". Council of the European Union. http://www.consilium.europa.eu/en/documents-publications/agreements-conventions/agreement/?aid=1999025. İstifadə tarixi: 2014-11-01. ↑ (1999-07-10) "Agreement concluded by the Council of the European Union and the Republic of Iceland and the Kingdom of Norway concerning the latters' association with the implementation, application and development of the Schengen acquis". Official Journal of the European Union L. İstifadə tarixi: 2014-11-01. ↑ "Protocol on the accession of the Government of the Italian Republic to the Agreement between the Governments of the Member States of the Benelux Economic Union, the Federal Republic of Germany and the French Republic on the gradual abolition of controls at their common borders, signed at Schengen on 14 June 1985". Government of the Netherlands. https://verdragenbank.overheid.nl/en/Treaty/Details/004288.html. İstifadə tarixi: 2014-10-31. ↑ 22,0 22,1 "Resolución de 26 de mayo de 1998, de la Secretaría General Técnica del Ministerio de Asuntos Exteriores". 1997-07-10. http://www.interior.gob.es/ca/web/servicios-al-ciudadano/normativa/resoluciones/resolucion-de-26-de-mayo-de-1998-de-la-secretaria. İstifadə tarixi: 2014-11-01. ↑ "Protocol between the European Union, the European Community, the Swiss Confederation and the Principality of Liechtenstein on the accession of the Principality of Liechtenstein to the Agreement between the European Union, the European Community and the Swiss Confederation on the Swiss Confederation's association with the implementation, application and development of the Schengen acquis". Council of the European Union. http://www.consilium.europa.eu/en/documents-publications/agreements-conventions/agreement/?aid=2007007. İstifadə tarixi: 2014-11-01. ↑ (2011-12-05) "COUNCIL DECISION of 13 December 2011 on the full application of the provisions of the Schengen acquis in the Principality of Liechtenstein". Official Journal of the European Union L. İstifadə tarixi: 2014-10-27. ↑ "Protocol on the accession of the Government of the Portuguese Republic to the Agreement between the Governments of the Member States of the Benelux Economic Union, the Federal Republic of Germany and the French Republic on the gradual abolition of controls at their common borders, signed at Schengen on 14 June 1985, as amended by the Protocol on the accession of the Italian Republic signed at Paris on 27 November 1990". Government of the Netherlands. https://verdragenbank.overheid.nl/en/Treaty/Details/004729.html. İstifadə tarixi: 2014-10-31. ↑ "Protocol on the accession of the Government of the Kingdom of Spain to the Schengen Agreement of 14 June 1985 between the Governments of the Member States of the Benelux Economic Union, the Federal Republic of Germany and the French Republic on the gradual abolition of controls at their common borders, as amended by the Protocol on the accession of the Italian Republic signed at Paris on 27 November 1990". Government of the Netherlands. https://verdragenbank.overheid.nl/en/Treaty/Details/004727.html. İstifadə tarixi: 2014-10-31. ↑ "Protocol on the accession of the Government of the Kingdom of Sweden to the Schengen Agreement of 14 June 1985 on the gradual abolition of controls at the contracting parties' common borders". Government of the Netherlands. https://verdragenbank.overheid.nl/en/Treaty/Details/007477.html. İstifadə tarixi: 2014-10-31. ↑ "Agreement between the European Union, the European Community and the Swiss Confederation on the Swiss Confederation's association with the implementation, application and development of the Schengen acquis". Council of the European Union. http://www.consilium.europa.eu/en/documents-publications/agreements-conventions/agreement/?aid=2004085. İstifadə tarixi: 2014-11-01. ↑ 31,0 31,1 (2008-12-05) "COUNCIL DECISION of 27 November 2008 on the full application of the provisions of the Schengen acquis in the Swiss Confederation". Official Journal of the European Union L. İstifadə tarixi: 2014-10-27.